Calcium phosphate can exist in one of numerous crystalline phases: brushite, dicalcium phosphate dihydrate, |3-tricalcium phosphate, octacalcium phosphate, hydroxyapatite, fluorapatite. Each of these crystalline phases has different solubilities, and many have been tested as potential methods of delivering calcium and phosphate ions to subsurface enamel lesions. The problem with applying crystalline material to the oral cavity to promote enamel remineralization is the poor solubility of the calcium phosphate phases, such that the calcium and phosphate ions are unavailable for remineralization. These crystalline calcium phosphate phases must be released from the product on contact with saliva and then dissolve in that fluid to liberate ions capable of diffusing into the enamel subsurface lesion. The dissolution of the calcium phosphate phase in saliva requires that saliva be undersaturated with respect to that crystalline phase. Based on some typical concentrations of calcium, phosphate, and fluoride ions in saliva, at the normal salivary pH range, these crystalline calcium phosphate phases would not dissolve (Larsen & Pearce, 2003). Brushite has been added to products such as dentifrices (Zhang et al., 1995; Sullivan et al., 1997) in an attempt to enhance the remineralization of enamel subsurface lesions. 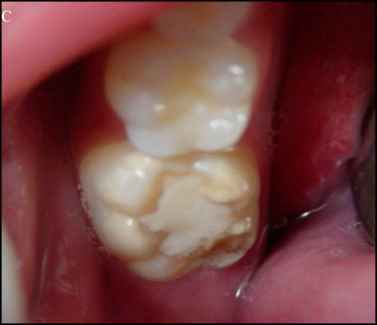 Brushite is one of the more soluble crystalline calcium phosphate phases; however, remineralization of subsurface lesions in vivo and slowing of caries progression in clinical trials have not been shown. Tricalcium phosphate (TCP) has recently been added to dental products that are claimed by the manufacturers to remineralize white-spot lesions. Interestingly, the TCP is referred to as "functionalized", since it has been altered by ball milling with sodium lauryl sulfate (Karlinsey & Mackey, 2009).We could not find clinical studies supporting its ability to remineralize enamel subsurface lesions. A variation on the use of crystalline calcium phosphates is the use of solid calcium sodium phosphosilicates. For dental applications, this calcium sodium phosphosilicate glass is marketed under the name of Novamin. It has been studied in vitro and clinically as a treatment for dentin hypersensitivity, with the proposed mechanism being the physical occlusion of dentin tubules (Greenspan DC, 2010). Novamin has also been claimed by the manufacturers to have applications in enamel subsurface remineralization (Burwell AK et al., 2009) or for prevent dental erosion.